I think it may be time to get rid of my land-line phone. Everyone in the family has a cell phone number so what is the point? But looking at the rates, it appears that I will only save $15 or so per month by dropping phone service from my bundle. Then again, fifteen bucks is something. Is there some good reason for keeping a land line that I haven't thought of? Church. I hate when people from church call me on my cell. Though I set up a google voice number for that. I thought this was going to be a thread about DDD moving out of his In laws basement. What a disappointment. MJ and I both only have cell phones. There are no drawbacks since all our babysitters also have their own phones. Your name won't be in the phone boom anymore. I didn't have a land line for the longest time, but about a year ago I was talking to a Comcast Rep who told me if I added a land line to my cable/internet service, the package would be cheaper than what I was currently paying. I only use it for conference calls, but I'm glad I have it. When there is a natural disaster and the power is out...the land line works while the cell/VOIP doesn't. "Don't expect I'll see you 'till after the race"
"So where does the power come from to see the race to its end...from within"
Land lines don't cause cancer. We still have a land line. But our kids don't have cell phones. Also, if I am home, I use my land line, as I have limited minutes on my cell phone. What's to explain? It's a bunch of people, most of whom you've never met, who are just as likely to be homicidal maniacs as they are to be normal everyday people, with whom you share the minutiae of your everyday life. It's totally normal, and everyone would understand. Ditto for conference calls. When the meeting is over an hour long, I'd rather have the option of easily muting my microphone. We are also bundled with Internet and cable. I know the price would go up, but I'm not sure how much. It just seems that we still use the land line enough to keep it. I never had a land line hooked up at this house. Every so often I miss the ability to fax something. I've got efax. It works pretty well. If we disagree on something, it's because you're wrong. "Somebody needs to kill my trial attorney." — Last words of George Harris, executed in Missouri on Sept. 13, 2000. I cut the cord some time ago but replaced it with an Ooma box. Space Ghost told me about it. The quality is very good and the monthly fee can be low as $3 something per month (including domestic long distance). I pay $10 per month for the premier features including a second number, conference calling, personal and community blacklisting (go straight to voicemail), anonymous call reject (again, sends them straight to VM), etc. Like others on here I use it mainly for conference calls and other times when the voice quality on a cell phone just doesn't cut it. TIP: when buying a box call them up and ask for a refurb. You can save quite a bit buying a refurb. I pay $10.00 a month for a landline simply because my wife always loses her cell phone. Definitely not as good as Vonage but for a $40 investment with no monthly fees or taxes (I think you pay taxes with Ooma), it has been pretty good. If Google starts to charge for Voice--they have committed to being free for at least 2012--then you may have to find another VOIP option. 1. reception is sometimes bad. 2. comcast internet + phone is the same price. 3. one number to get a hold of us. 4. I hate holding my cell phone to my head for long periods of time. regular phone feels better. and those blue-tooth ear clips look stupid. We got rid of our landline 2 years ago. We have 4 cell phones (myself, wife, 2 teenage daughters). The downside we see most often is when the girls are not home and my wife and I leave our 12 year old son home to babysit, he doesn't have a phone in case of an emergency. We have to leave him one of our phones. That's the biggest downside to not having a landline, but probably only applies if you have children. I keep it b/c I have young kids and if they dial 9-1-1 our information automatically pops up. I also intended to use it for my fax machine, but never got around to it. I should try this eFax business SCC referred to. Nope. We've been rid of our land-line for 10 months and haven't regretted it one bit. Everything in life is an approximation. Got rid of the land line 4-5 years ago, I've never missed it. The cell phones are more expensive than the land line, but the cell phone is more than just a phone to me and my girls. When they are at their mother's house, the phones are a connection between the girls and I that is more meaningful than a land line. Thankfully texting saves on minutes, my teen/pre-teen girls currently burn through about 4k texts every month. 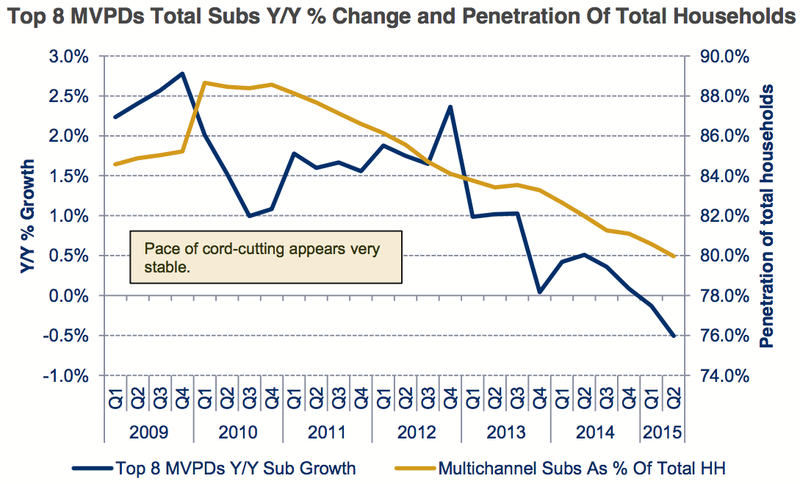 What we're looking at here, via Wall Street research firm Pacific Crest, is cable subscriptions falling off a cliff. In the first half of 2015, year-over-year growth in MVPD subscribers — "multichannel video programming distributor," or, in plain English, a cable company like Time Warner Cable or Comcast — went negative. Over the past five years, the percent of households with cable subscriptions has been falling. But with year-over-year subscribers still seeing growth, however modest, cable companies were still able to look past what some had seen as a coming cord-cutting apocalypse. Now, that is a reality. When, do you think, the cable companies will start metering their internet and charging for transfer? When will they start? Comcast is already rolling it out. I thought there was an "official" thread somewhere, but was satisfied to find any thread. Are you a frugal college football fan and/or a hip Millennial? Chances are, you’re one of many American TV consumers who’ve cut the cord! But now that it’s college football season, you might feel obligated to buy back into the morass of high-dollar cable and satellite providers, just to enjoy the fabulous myriad of games across multiple networks each week. Don’t do that, friend! (Unless you’re a Pac-12 fan.) We’ve assembled a quick guide on how to watch almost every college football game via non-traditional digital and streaming platforms. That second link highlights all the best games in navy blue. I'm this close to cutting the cord. In fact, I'm currently redoing some of the wiring in my house to make internet available in all necessary rooms. Cat5 cable runs to all rooms but I'm hooking it all up to ethernet plugs and putting in a switch in the panel. One question, what download speed is needed to cut the cord? I'd probably stream at max 3 different videos at once. We currently get around 100mps, which I assume is overkill, but just want to make sure. I assume you mean 100 mbps. You should be fine. Lol. Don't be such a nerd. Hey! That's an important detail.